I know, I know, no one wants to think about back-to-school time. 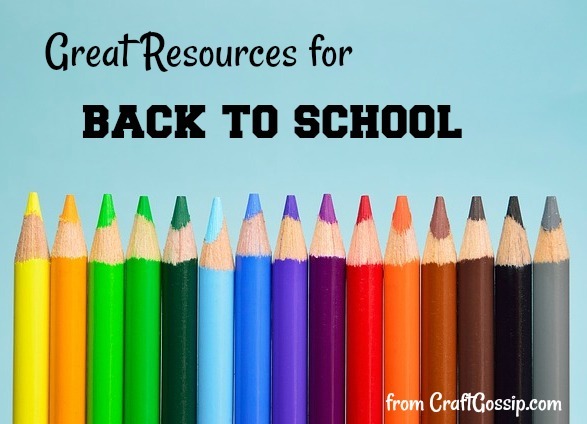 But I know some people who have gone back already and many of us will have kiddos heading back to school soon (or starting up homeschooling again), and there are ways to make it a little more fun for all of us. If you have preschoolers or are a preschool teacher, check out these cute back to school songs for preschoolers. They’d be great for circle time or walking through the halls. You’ll find them at Teaching Mama. You might also like to do a preschool countdown with books about going to school if you have a child who is going to school for the first time, or who has the jitters (or is excited about it, for that matter). Hands On As We Grow has the details, and Buggy and Buddy has a great list of books for back-to-school time not just for preschoolers. Or keep your countdown a little simpler (but still super cute) with a paper chain countdown like the one at Preschool Inspirations. Tear a loop of each day until it’s time to go back to school. Honestly, I think my almost-8-year-old would love one of these, too. My Life and Kids has a great roundup of back-to-school games, some of which are great for teachers to use in the classroom and others can be played at home. Or check out the back to school word search from Superheroes and Teacups. This sweet bus craft with family photos from No Time for Flash Cards is great for a child going to school or riding the bus for the first time, or for a child missing their older sibling while they are still at home. You’ll find more great jokes in the form of printable lunch notes at Happiness is Homemade, where she also has an amazing roundup of other sources for printable lunchbox notes that will keep you going all year. Make your mornings a little easier with tips from B-Inspired Mama. And don’t forget to do something cute for your first day of school photos (might I suggest my easy chalkboard sign?) and make sure you think about your family’s privacy before you post those photos online (thanks for the reminders, JDaniel4’s Mom). How do you celebrate or prepare for going back to school? I’d love to hear your ideas!